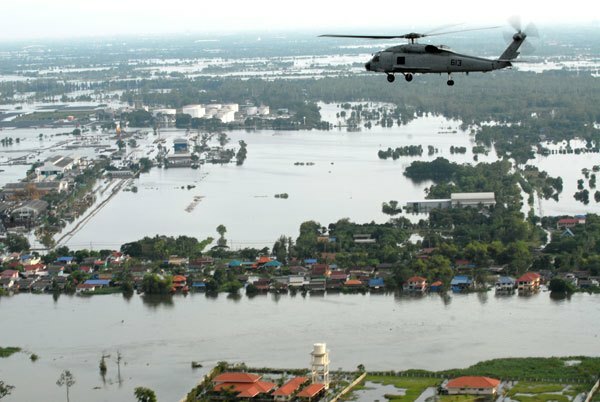 Like most Bangkok residents, I admit to having more than my share of “pins and needles” as a result of the ever encroaching floodwaters on the centre of Bangkok. Having endured “pins and needles” for so many years, this current situation has only exacerbated the condition. The floodwaters continue to leave a trail of destruction in many outlying urban districts and the pressure mounts on those of us who are yet to experience the brunt of the approaching swell. The news is dominated with images of poor souls who have lost their homes, their possessions, their livelihoods and in some cases their lives (more than 500 to date). There is no escaping the media, and the locals talk of little else, so we live in a state of nervous anticipation as we stare out at the horizon and wonder if we are next. The government response has only added to the anxiety and confusion as they never seem to speak with one voice. There are conflicting opinions on the current situation and how to deal with it and no one really seems to know the precise direction in which the deluge will move next. All residents are preparing as best they can for what would seem to be the inevitable onslaught. When will it arrive? How long will it last? Gary and I are fortunate to live on the 22nd floor of an apartment complex and we can look out on centralBangkok where life just seems to go on as normal. It’s as though we have a false sense of security, as only a few miles away people are wading through torrents of dirty water, in some cases waist deep. It is especially unnerving to read about the snakes that infest some areas and the significant number of crocodiles that have been displaced from their crocodile farm homes. I have never been too fond of reptiles unless they were on a television nature programme. To have them sharing one’s own backyard is a somewhat disturbing image. Many people are suffering from headaches, muscle tension, skin problems, respiratory problems, digestive problems to name but a few of the ailments that result from the filthy water. Like so many others we have been stocking up on food and water. So many essentials, however, are missing from the supermarket shelves as hoarding of basic items has been going on for weeks now. My major concern is that the electricity will be cut. In a building like this we would have no running water, no air-conditioning, no television and no way of negotiating the twenty-two floors to the outside. Life, however, could be a lot worse and I am so grateful for what we have and know only too well that there are countless others who are in dire straits. The resilience of the Thai people never ceases to amaze me and their smiling faces are a constant reminder that we should always look for a positive spin during adversity. The sun is shining (temperatures in the 90s in the shade!) every day. Tomorrow is another day and who knows what that may bring. One thought on "Ray King: Floods in Bangkok"
just returned from the UK and had a few days in Amble visiting an old friend! (Ivan Johnson).I had a wonderful day in Alnwick and another in Bamburgh(family seat! )as well as another old friend in Shilbottle,always great to visit Northumberland!If you are in difficulties in Bangkok you are more than welcome to our humble abode near Pattaya! !